The Bayou Tourterelle is sanctuary for a pair of adolescent raccoons, various endangered birds including the Ivory Billed Woodpecker, rattle snakes, a boy named Chap, his mother, and the Sugar Man–all in Kathi Appelt’s “The True Blue Scouts of Sugar Man Swamp” (Atheneum 2013). Well, the Ivory Billed Woodpecker hasn’t been seen in years, but Chap’s recently- deceased granddaddy Audie saw it some years back and says he took a Polaroid shot of it. But even that has been lost. He also took a Polaroid shot of the huge furry Sugar Man (cousin to Bigfoot), but Sugar Man hasn’t been seen in a generation or two. Who is to believe that either exists? Chap and his mama fry sugar pies at the Paradise Café, but that’s subject to change when villain Sonny Boy Beaucoup and his alligator-wrestling sidekick Jaeger Stitch enter. They want to raze the bayou and build a Gator World Wrestling Arena and Theme Park. Oh, that just can’t happen. The raccoons J’Miah and Bingo live in a rusted out ’48 DeSoto hidden in the swamp. Their parents gone, they fend for themselves climbing trees and foraging for crayfish until they discover those fried sugar pies cooling at the Paradise Café—pies made from the muscovado swamp sugar cane. Dee-licious. The swamp-side stand of sugarcane is guarded by a mass of slithering rattlesnakes, but Chap knows that to harvest it he has to lull those rattlers to sleep with a particular lullaby. Not only are Sonny Boy and Stitch ready to break ground for the theme park in the swamp (unless Chap and his mama can come up with a “boatload of cash”), but a herd of feral hogs is headed to the bayou and surely they’ll destroy all the swampy flora—not to mention the fauna—to get that sugar cane. 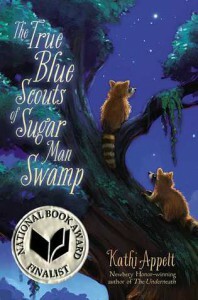 As true blue swamp scouts, J’Miah and Bingo must find and wake the Sugar Man, who has been sleeping for 60 years. Only he can save the swamp. Her cast of characters drives a great eco-yarn. You’re pretty sure who is going to win out, but the journey is a whole whopping lot of fun. Boy, would I love to read this aloud to a class of third graders. Patricia Hruby Powell will be begin reviewing young adult books December 15.